Twinmotion Dynamic Link allows synchronizing instantly the Autodesk® Revit® model with Twinmotion 2019. It also exports the project in FBX if the visualization needs to be done on another computer. You can download a trial version of Twinmotion on www.twinmotion.com. - Synchronize your Revit model directly and in real-time to view it in Twinmotion 2019. - Make changes to the model or materials, and see those changes immediately in Twinmotion. - Standard materials, People, and Trees are automatically converted in Twinmotion materials, People, and Trees. - Temporary mode and cameras view are managed in Twinmotion and cause changes with each synchronization. - Export models, materials, and textures via FBX. - Model optimization to reduce the number of polygons. Both the exporting and syncronization tools in this plugin work most of the time, but it still messes up things. One thing that happens when I export and .fbx file or sync to Twinmotion, the software will get rid of material changes I have made to the Twinmotion file. Often times it's just random to what it changes and it even changes materials that I haven't even manipulated in Twinmotion. Chargement très rapide, pratique pour visualiser et faire un rendu express ! 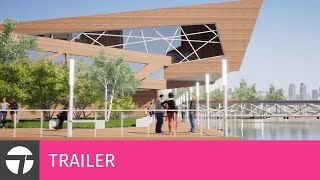 Permite ahorrar un monton de tiempo al trabajar en paralelo entre Revit y Twinmotion. Ojala que pronto esté disponible la version 2019. Je recommande ce plugin ! Plugin simple et efficace d'utilisation, je le recommande ! I find the direct link smoother to use compare to .FBX export. The application works very well. The automatic substitutions (vegetation and characters) makes my life easier and it save lots of precious time. Existe previsão para o revit 2019? Hi Lucas, a new version compatible with Revit 2019 is under development it will be released soon. After installation, Revit models become corrupted. Materials after the export look different, which requires adjustment work. I have exported my revit file and after that i imported that file to twinmotion but it is not showing my project in software. I wish my problemcan be solved!